The first 36-channel Magnetocardiographic (MCG) system, successfully installed in the Biomagnetism Research Center, Catholic University of Rome, has been tested to evaluate the reliability of this novel instrumentation for the study of patients with coronary artery disease (CAD), in an “unshielded” laboratory for interventional and emergency cardiac care. 13 patients, with coronary disease documented by angiography, 8 patients with abnormality of non-invasive studies (exercise-ECG or SPECT), and 13 healthy controls (agematched) were investigated at rest. Other 6 cases were investigated, before and after stress test with a standard ergometer. The sensitivity of the system was 20 fT/√Hz, at 1Hz. 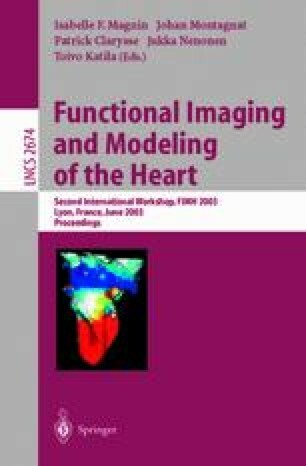 After morphological evaluation, quantitative analysis of magnetocardiographic repolarization parameters was performed according to Hänninen et al. and Park et al. At rest, magnetocardiographic mapping has shown abnormality of repolarization in 95.2% of CAD patients, with sensibility of 92.6%, specificity of 92.3%, and predictive value 92.3%. Supported by MIUR grants # 9906571299-001 and 2001064829-001. The authors are also grateful to Dr. Carl Rosner, Prof. Alexander Bakarev, Prof. Alexander Braginski, Dr. Nikolai Korsun, Dr. Karsten Sternickel and Dr. Jury Poliakov for continuous help in solving the problems for the CMI system installation and for the stimulating scientific cooperation. The significant support of Dr. Jukka Nenonen of the Helsinki University of Technology has been fundamental to this work. The dedication of Mrs. Viola Iacobini, our professional nurse, is outstanding and invaluable.